StylPro review UPDATED! Second time lucky? I'm embarrassed to admit this, but until yesterday, I hadn't washed my brushes since that fateful day in August – despite the fact that StylPro sent me two bottles of their StylPro Makeup Brush Cleanser (€14.95 each and currently included with each StylPro purchase on the Meaghers Pharmacy website). So I decided to give it a second go, bearing in mind all that Sharon had covered in her own blog review. First things first: I used the StylPro Makeup Brush Cleanser for every brush (I have around 20 in total). Strictly speaking, it's only necessary for oil-based products such as foundations, and eyeshadow will come off brushes with baby shampoo or similar, but I wanted to see what their own-brand cleanser was like. I also decided that I would empty and refill the bowl after every brush; the cleanser isn't antibacterial, so any bacteria that's removed from the brush in the washing stays in the liquid after the brush has been cleaned. So – what's the verdict from my StylPro review (take 2)? The most important thing about the StylPro, really, is whether or not it works. When I did my original StylPro review, my jury was kind of out. I really, really wanted it to work, but my foundation brushes weren't quite squeaky clean – which I put down to my use of the wrong products, and bad technique. This time? 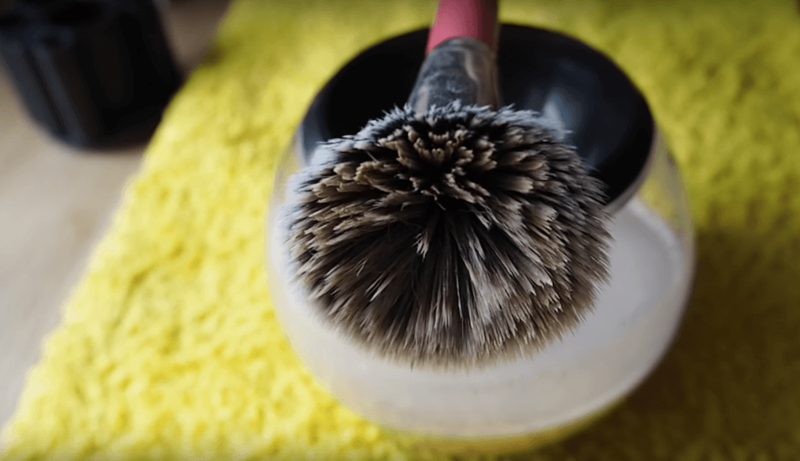 Every single one of my brushes came out squeaky clean, totally dry and incredibly fluffy – they looked like new. Even my RealTechniques Bold Metals brushes (I have the 101 Triangle Foundation, 301 Flat Contour and 200 Oval Shadow brushes), which have dodgy-shaped handles and, I thought, wouldn't react well to being whizzed around like crazy, came out perfectly. My list of cons, I'm sad to say, is pretty damning. Firstly, I used up an entire bottle of Makeup Brush Cleanser in just one go – and it took me around 45 minutes. The cleanser bottle says to use a capful per brush, but that just wasn't producing enough liquid for my brushes to get covered, so I ended up using one-and-a-half per brush. Even if I used baby shampoo for my shadow and powder brushes, I'd still be going through half a bottle every time I cleaned them – so the StylPro (which will set you back at least €65) would effectively cost me €7.50 per go. There's also the issue of damage; I'm not fully convinced that spinning your brushes around at a rate of knots won't harm them in the long run – and, in fact, I had my first casualty. While removing the collar from one of my beloved Blank Canvas foundation brushes (the F20, which I bought as a duo set in the Black Friday 2015 sale), I inadvertently yanked the brush portion out of the handle and it was destroyed. Granted, I was a little rough with it, but I'm not 100% sure that it was entirely my doing. It's also just fairly cumbersome. Placing and replacing the collars on different brushes; emptying and refilling the bowl; cleaning out the bowl (and then the sink, which got really oily and grimy) afterwards... There are a lot of steps, and though it cuts out the drying time, I don't really find putting my brushes on their side in the hot press a huge ordeal. Well, get to the point: is it a yay or a nay? Like I said, I really, really wanted this to work – but in my opinion, it's just not quite there yet. I don't see how it's feasible to produce an expensive enough tool that essentially only works in tandem with another product (the StylPro Makeup Brush Cleanser), not to mention the fact that it takes a decent amount of time and involves a lot of messing around. All that and it's described as a pro tool – when I just can't imagine any make-up artist paying €7.50 a pop to spend 45 minutes and a lot of effort cleaning their brushes. Full disclosure: I was given the StylPro Brush Cleanser by PREEN (which no longer stocks it) in order to review it. StylPro sent me the Makeup Brush Cleanser. I was not paid or otherwise compensated for reviewing (either on YouTube, or here) the StylPro. This post contains affiliate links. What does that mean? If you click through one of the links above and buy something as a result, I’ll get a small percentage of the sale. It won’t cost you anything extra, but it will help me continue to create content on rosemarymaccabe.com and beyond. I will always disclose if a post is sponsored or contains affiliate links; for more, check out my disclaimer.